When it comes to healthcare, data is everywhere. According to a leading global research and advisory firm, over 85 percent of U.S. healthcare organizations have adopted electronic healthcare records (EHR). But with so much adoption, just having data isn’t enough. 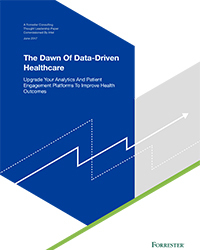 The second report in this series, this paper looks at how the ability to quickly extract and use insights is critical for healthcare organizations looking to gain a competitive edge. And while many providers have lagged in adopting insight-driven systems in the past, the same research firm expects a heavy investment in this technology in the year to come. Armed with this knowledge and a set of key recommendations, healthcare providers can move beyond making operational decisions based on past-data analysis and instead use real-time insights to reshape the future of healthcare.